Blog > Issues > Property Rights > Ms. Knick goes to Washington. Again. Ms. Knick goes to Washington. Again. When you first meet Rose Knick, you’re hard-pressed to find evidence that she could trigger a true property rights renaissance across the country. That was certainly the case for the man who joined Rose, PLF attorney Brian Hodges, and me as we waited to get into the U.S. Supreme Court building in the early hours of January 16. Since there were two cases on the docket for oral argument that morning, Brian asked the stranger which one he had come to see. Sir, meet Rose Knick. Her case is first this morning. To his credit, the man was contrite when he learned Rose’s identity. She is, after all, very unassuming. Standing barely five feet tall, the 70-year-old retiree moves stiffly and the mid-January cold only worsens the arthritis in her knees. But Rose shares a distinction very few Americans can boast: Her case, Knick v. Scott Township went before the Supreme Court—twice. With that distinction, her case joins Roe v. Wade, Citizens United, and Brown v. Board of Education in the annals of high court history. For 33 years, federal courts have been allowed to bounce people like Rose back to state courts, which are mostly unwilling or unable to deal with such takings claims. Thus many attorneys give up even before they start. I’m not surprised. I first spoke to Rose by phone in early 2018 for a profile in our monthly At Stake newsletter and grew to know her in the months that followed. After calling me the day before the oral argument to find out how many quarters she’d need for the lockers at the Supreme Court building, she and her nephew trekked from the small town where she lives, just north of Scranton, to watch the first argument in October 2018. As overwhelmed as she was, Rose was also curious, and stuck around DC long enough to attend a post-argument panel discussion at George Mason University. There, she cornered panelist Ilya Somin of GMU and the Cato Institute with follow-up questions about a legal nuance she read in an amicus brief he co-authored. That the justices saw fit to bring Rose Knick’s case before it again speaks volumes to the importance of the case. To deny Rose—or any American—the ability to challenge government abuse of this fundamental right is an abomination of the Framers’ intent. 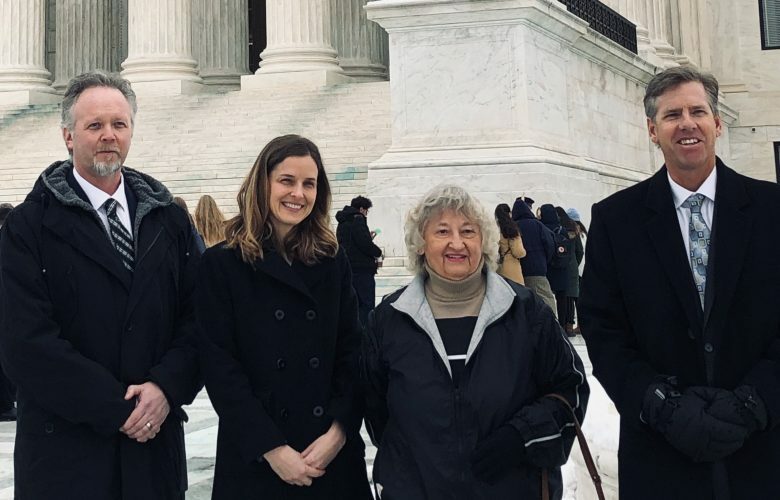 Rose flew to DC the second time (she hadn’t boarded a plane in many years) and watched PLF attorney Dave Breemer argue on her behalf once again. She’s right—no one who took part in the two Supreme Court arguments is in her shoes. But, as she told the man during our early morning encounter, one day they could be. Freedom is a lot of things to a lot of people—it’s what puts the “individual” in “individual liberty.” For Rose, it’s simply the ability to head to the top of a hill at her farm and watch the sunset in peace. Before Rose headed back home, PLF President Steven Anderson presented her with the American flag that flew above the Capitol building on October 3, 2018—the day of Rose’s first Supreme Court argument. We thank Rose for doing the most American thing any American can do: stand up for her property rights.